India�s global trade prospects for the March quarter looks strong and bright, suggests the recently launched DHL Global Trade Barometer (DHL GBT). According to DHL, the Indian air and ocean freight remains strong owing to the high demand seen for commodities and equipment, driving the growth. The country�s trade in machinery and high-tech goods continues to underpin its growth, while increased imports of industrial raw materials point to an extended period of trade development for the nation. DHL has joined hands with the IT major Accenture to bring out the DHL Global Trade Barometer. Using the data collected from seven countries - China, South Korea, Germany, India, Japan, UK and US, a quarter-wise outlook has been provided. Together, these countries account for 75 percent of world trade, making their aggregated data an effective bellwether for near-term predictions on global trade. India�s economy has brighter prospects than any of the world�s seven largest contributors to global trade. The first ever DHL Global Trade Barometer is an early indicator of global trade developments calculated using Artificial Intelligence and Big Data. The predictions/the indicators from DHL GTB are expected to help the players optimise the business process, identify new business opportunities, and improve capacity according to the projected demand. 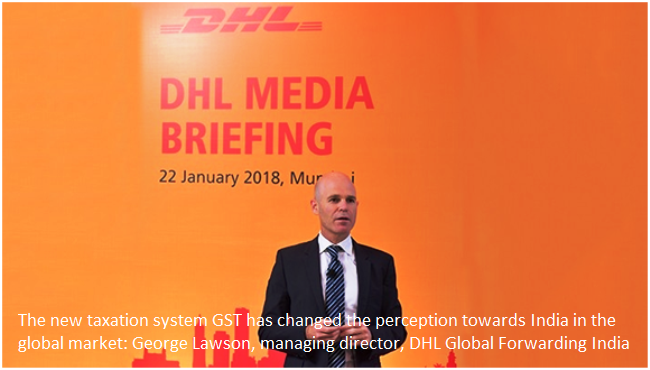 Lawson added that the domestic market also continues to create interest post GST because of the freedom of cargo movement from state to state. DHL in India, he said, will invest in technology to facilitate an easy trade environment. The company is expected to do an investment to the tune of $250 million over the next few years.